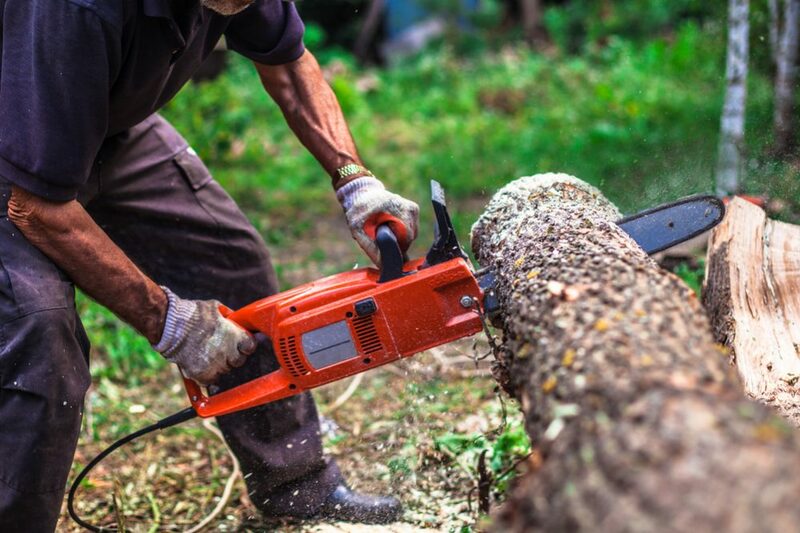 If you need to cut down trees, trim branches or prepare firewood, having a reliable chainsaw will save you a lot of time and hard work. Nowadays, there are many excellent electric versions to choose from, so here are our top picks for the best electric chainsaw. If you are looking to buy a chainsaw for home use, you are probably wondering what your options are. What are the different types of chainsaw and what are their relative advantages and disadvantages? First, we’ll have a look at the different types of chainsaw and talk about why an electric model might be the best option – after that, we will look at how to choose the best electric chainsaw for your requirements. Which kind of chainsaw should you choose? Chainsaws can be broadly divided into three categories, gas chainsaws, battery-operated chainsaws and electric chainsaws. Each has its own merits as well as drawbacks. Let’s have a look at each in turn now. Gas-powered chainsaws are the biggest and most powerful models – these are the tools of the professional lumberjack or those who need some serious heavy-duty cutting power in a saw. The biggest advantage is that with a gas-powered model, you have the size and the power to tackle just about any job you can think of, right up to cutting down some of the biggest trees there are. The other advantage is mobility. You can take a gas-powered chainsaw anywhere you like, and as long as you take gas with you to fill it up, you can use it as long as you need to without any restraints. However, one of the biggest disadvantages is that they can sometimes be too big and too powerful. If you are not strong enough to use a large and heavy chainsaw, attempting to do so could be quite dangerous. The most powerful versions are only really suitable for professionals. There are a couple of other disadvantages, too. They are usually the noisiest of chainsaws, and if you use a loud gas chainsaw at home, your neighbors might disapprove. You will also need ear protection or you will damage your hearing pretty quickly. Since they run on gas, they are also not the most environmentally-friendly option. Gas chainsaws give off harmful emissions, making them the most polluting type of chainsaw. 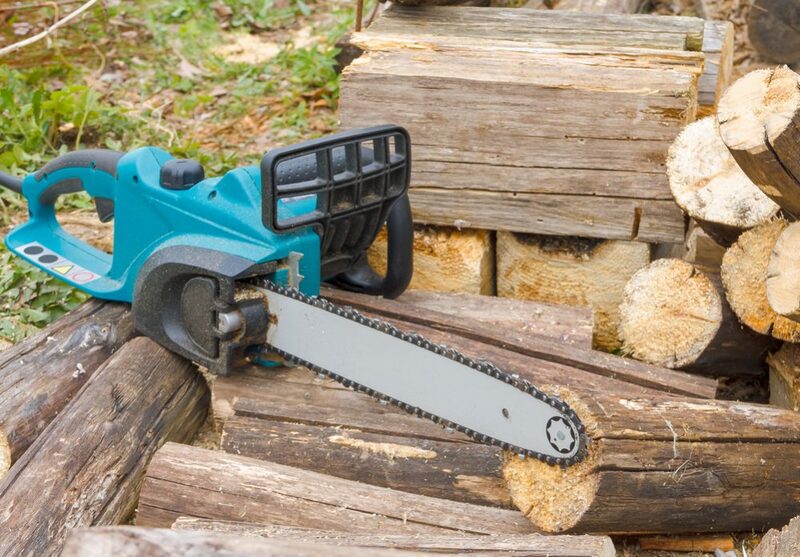 Battery-powered chainsaws are a more modern development, and for the casual user, can offer several advantages over gas-powered versions. First, they are non-polluting. Since they run off batteries, there are no dangerous emissions to worry about. They are also usually much less loud, meaning you need to worry less about noise pollution as well as hearing damage – although you should still wear ear protection when using one. Since they run off batteries, they give you similar flexibility to a gas-powered option, and in general, they are also usually smaller, making them more manageable. They are more suited to home users who might not have the experience or strength of a professional. Of course, they have their limitations too. Battery-powered chainsaws, being smaller and less powerful, will not be up to more heavy-duty cutting – if you need to cut larger trees, one of these will not be sufficient. The other problem is that although battery-operated chainsaws give you the same mobility as a gas-powered chainsaw – in fact, perhaps more since they are usually smaller and lighter – batteries can quickly run out. 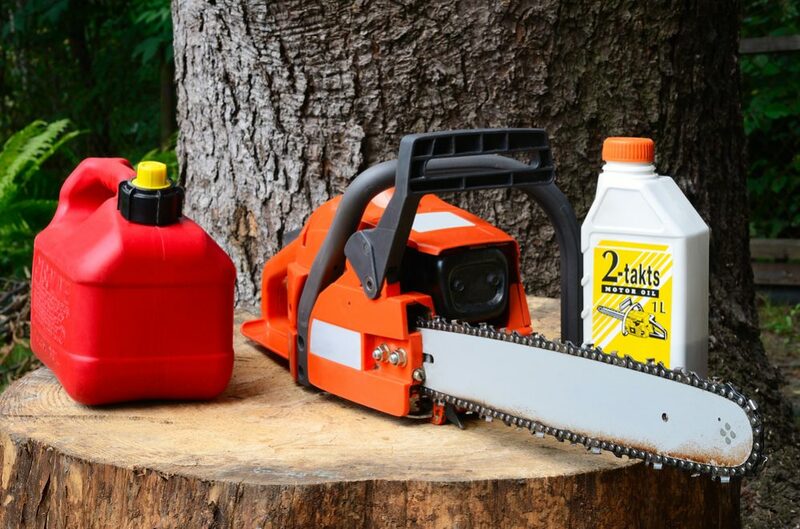 Although it might be possible to take spares with you, for more intensive use it is much more practical to take gasoline with you and simply fill your chainsaw up as required. Electric chainsaws also have advantages and disadvantages. The main positive is that since they are run from an electrical outlet, they never run out of power – you won’t ever have to refuel an electric chainsaw or replace the batteries. Since they run on electricity, they can also offer more power than a battery-powered chainsaw. Since battery-powered chainsaws quickly run down the battery, their power ratings are limited, but this is not the case with electric chainsaws. While gas-powered chainsaws are still the biggest and most powerful, some electric chainsaws are now being produced that come close to challenging them. Despite this increased power, electric chainsaws still run much more quietly than gas ones, making them more suitable for suburban environments where you have your neighbors to consider. They are also easier to start – there is no pull-cord like with gas models. However, they have one major drawback, the cord itself, and this creates two problems. First, you need to be near a power source. You will be able to extend their range by using an extension cable, but you can still only use an electric chainsaw if you are close enough to a power outlet. You can’t take them into the deep forest, for example. Secondly, the cable can get in the way. If you are using an electric saw, you always need to be careful the cable doesn’t dangle in your way – if you cut through the cable, the result could be quite dangerous. However, some models incorporate a hook or other safety features to minimize the risk. Overall, an electric saw would be ideal for someone who will always operate close to a power outlet, who doesn’t need extremes of power and who prefers something smaller and more manageable than a bulky gas model. If you think an electric chainsaw sounds like what you need, here are some of the things you should look for when buying one. The type of jobs a chainsaw can manage is largely determined by its size – and this means the length of the bar. Most electric saws are 16” in length, and these models are enough for basic jobs that most people need to do in their garden. However, if you need something capable of dealing with slightly larger jobs, like cutting down bigger trees, you might choose to opt for something slightly larger, like an 18” version. Smaller 14” versions also exist. The power of the chainsaw is also important. If you only need something for trimming branches, you won’t need much power. However, if you are going to be cutting down small or medium trees, opt something that packs a bit more of a punch. Weight is important – if you are not the biggest or strongest person, trying to wield a chainsaw that is too bulky for you can be dangerous. Think about the jobs you need it for as well as your own strength and choose something appropriate. Safety features are a vital consideration. One of the most dangerous aspects of using a chainsaw is “kickback” – this is when the blade hits a snag and bucks back up at you. Obviously, this can be dangerous, and many chainsaws are designed to minimize this kind of occurrence. Other safety features may include hand protection and others. Make sure you check out which safety features a particular model has before buying. Chainsaw chains and bars need to be oiled to maintain them in optimum working condition as well as to increase their lifespan. With older chainsaws, you needed to lubricate them manually but with most modern electric chainsaws this is no longer necessary. With most electric chainsaws, there is an oil reservoir that lubricates the chainsaw automatically. Make sure the chainsaw has this feature and check how easy it is to see the indicator as well as how much oil the reservoir holds. If you are looking for a compact corded chainsaw that packs plenty of power for general garden tasks, this model from Remington could be well worth checking out. It has a 14” bar and is designed to deal easily with jobs like trimming and cutting small branches or saplings. It weighs only 6lbs and is light enough and compact enough to make it easy to use. Even if you don’t have the size or the strength to wield a larger chainsaw, you should be able to use this one without any trouble. Although not a big model, it packs a very reasonable 8 amps of power, easily enough for it to cope with the kind of general tasks most people need to use a chainsaw for in their garden. Starting it is easy, too. Unlike with large gas chainsaws, there’s no starting cord that requires a strong tug. You simply press the button and it roars into life, ready to take on any jobs you put it to. We like the safety features, too – something that is very important in a chainsaw intended for general use by non-professionals. It has a low kickback bar and chain, meaning that if it snags on something hard, it won’t kick back at you dangerously and violently. It also has a wraparound handguard to protect you from harm. Maintenance is a breeze, too. The push-button oiler means you don’t need to worry about lubricating the chain and the bar manually – you simply press the button and the chainsaw self-lubricates. The chain also has an external adjuster, making it easier to control the tensions of the chain. Despite its smaller size, this chainsaw benefits from a tough and rugged built – if you look after it properly, this is a tool that will serve you for a good many years. Overall, this is an easy-to-use chainsaw with adequate size and power for general garden tasks. It is well built, includes several valuable safety features and is also a highly reliable piece of kit. If you are looking for an affordable corded chainsaw with these kinds of qualities, this one could be well worth checking out. This 16” corded electric chainsaw from Worx is a powerful tool designed for general use in the garden. At 14.5 amps, it is designed to give almost the same kind of power as a gas chainsaw and will be up to any day-to-day tasks. It is very well designed and includes several important safety features. For example, the bar and chain are designed to minimize kickbacks. It also incorporates a chain brake system to ensure the safest possible operation. This is designed to stop the chain quickly in the event of hitting something hard, minimizing the risk of injury due to any kickback that may occur. It has also been designed to be as easy to use as possible. At only 11lbs, it is made to give you plenty of power while still being small enough for anybody to use – even those not strong enough to use a larger gas-powered saw. Another feature that makes it more user-friendly is the auto-oiling system. With this unit, there is no need for you to remember to lubricate the chain because it does it itself. All you have to do is fill the oil reservoir – which is easy to see with a clear oil level indicator. We particularly appreciate the patented auto-tension system. This secures the bar and chain while maintaining the chain at the correct tension for safer and more effective cutting. It also features comfortable, well-built grips for increased levels of comfort and ease of use. If you are looking for a respectable amount of power in a corded chainsaw for general use around the home, this would be a good pick. It will easily be able to handle cutting tree branches, removing small trees, sawing firewood or any other similar tasks. If you like the sound of the 16” Worx saw above and all the features it includes but feel you need something just a little bigger and more powerful, this model, its bigger brother, might be the right pick for you. Everything that makes the 16” model a great option is also present here. This includes the anti-kickback system and the chain brake that are designed to protect you if the saw hits a snag. The auto-tension function is also here. With the simple turn of the oversized wheel, you can easily ensure the chain doesn’t become too tight. Similarly, the auto-oil system is found on this model, lubricating the chain for you and making it easy to see when you need to refill. Despite being a larger model, it is not significantly heavier than the 16” version – weighing in at only a little above 11lbs, this is still a saw that is easy to pick up and use, even if you are not particularly big or strong. The rubber over-molded rear handle also makes it comfortable to hold. The main reason you would choose this saw over the 16” version is that you need something that is capable of dealing with slightly bigger jobs than the smaller model. With an 18” bar and 15 amps of power, this saw gives you just that bit more cutting capability. This means if you have bigger jobs you need to take care of, like cutting down medium-sized trees or working through more significant amounts of firewood, this might be a better pick. The fact that the price tag is extremely reasonable makes this saw excellent value, too. This would be the right pick for someone who wants a corded chainsaw for moderate use and who needs something approaching gas-powered chainsaw performance levels but who prefers to opt for an electric version. If this sounds like you, this saw is highly recommended. This 16” corded chainsaw is another option worth considering, this time from well-known brand Makita. It features an ergonomic design with a comfortable rubberized grip and a large trigger, making it easy to pick up and hold as well as simple to operate. The trigger initiates a soft start, meaning it won’t jerk out of your hands with a sudden burst of power when you use it. One great feature is the toolless blade and chain adjustment capability. It includes a large wheel that you simply turn to ensure the tension of the chain is just right for the best, most efficient cutting. Something we also really approve of here is the current limiter. This is a very important addition and prevents the saw from burning out through intense use. This allows you to continue cutting without worrying that your saw can’t take the strain and might break down. Another great feature, common to many electric chainsaws but welcome nonetheless, is the auto-oil system. This allows the saw to lubricate the chain automatically, meaning you don’t need to think about it. The reservoir holds a decent volume of oil, meaning you won’t need to refill too often – and the window is also large, making it easy to see when an oil top-up is required. We find this saw to be extremely high quality, especially in this kind of price range. It packs plenty of power and will make short work of most of the regular tasks it will be needed for in the average garden. At just a bit over 15lbs, it is also not a heavy tool, making it a good pick for those who might have more trouble handing larger or more powerful models. 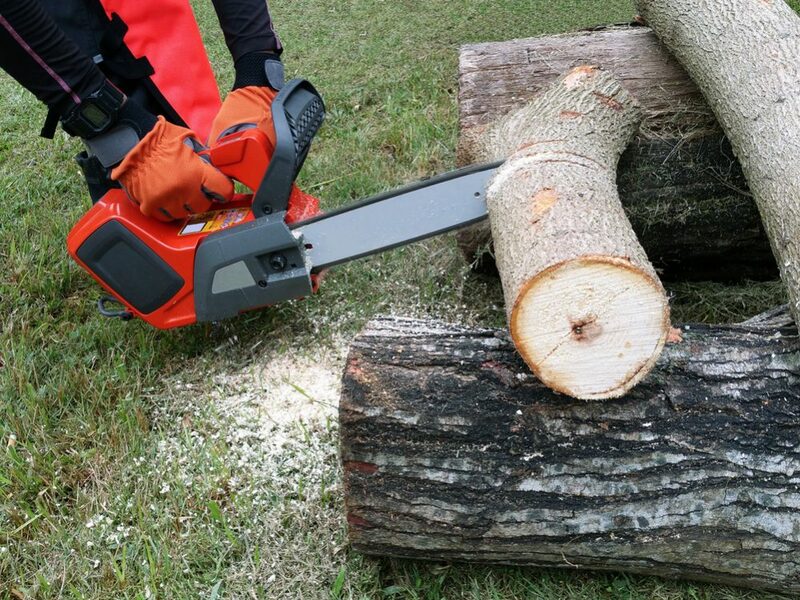 To summarize, this chainsaw offers a great combination of power, reliability, comfort and ease of use. If you are looking for a manageable saw that is substantial enough for general day-to-day tasks like trimming small trees and branches, this could be an ideal pick. For a corded electric chainsaw, you can rely on and that won’t burn a hole in your pocket, this is another option that is well worth looking at. Poulan is another established and well-regarded name in the world of garden tools, and this electric chainsaw is another one of their high-quality products. It features a 16” bar and chain and delivers enough power to cut through smaller trees, branches or firewood with no problems. At only 11lbs, this is also a chainsaw that just about anybody can use, even if you find larger chainsaws too bulky and powerful. Its ergonomic inline engine is designed to make it comfortable to hold, offering greater levels of balance and control, and the simple chain tensioning system allows you to adjust it so that it is always configured for the most efficient levels of performance. As you would expect, it also includes several important safety features. For example, it is designed to minimize kickback – and also incorporates a chain brake alert to help keep you safe if anything goes wrong. As with many comparable corded electric chainsaws, this model also has an auto-oiling capability. This means that as long as you keep the oil reservoir topped up, it will take care of lubricating the chain for you, decreasing wear and improving performance and lifespan. This chainsaw is designed for medium-duty work. This means it can easily deal with small or medium-sized trees as well as any other similar tasks. The things we like most about this saw are its ease of use, its simple design, the fact that it requires minimal maintenance and that it is lightweight and compact. It is tough and dependable and should give you many years of good service. If you are looking for a smaller, manageable corded chainsaw that will get the job done and won’t let you down when you need to push it to its limits, this would be a good pick. It is reasonably priced, representing great value for money, and comes highly recommended. This saw from Zombi is another 16” cordless model that is designed to pack a punch. If you require a saw that can take care of any light or moderate sawing tasks with ease, this is another option that should be on your list of possibilities. At 13 amps, it has plenty of power to slice through small or medium-sized trees or branches without any problems. As long as you don’t need something for truly heavy-duty use, this saw should be sufficient for most home garden requirements. It includes several safety features, like the front hand guard and the safety lock button. This button is designed to prevent it from being switched on by mistake, helping to avoid any accidents. At under 14lbs, it is lightweight and practical to use, and the rubber over-mounted handle is designed to protect your hands while also making it as comfortable as possible, even for prolonged use. The chain incorporates steel bucking heavy-duty teeth, increasing the saws cutting ability, and it is also easy to adjust the tension of the chain – no tools are required. Another feature that makes this easy to use and convenient to maintain is the auto-lubricating feature. As with most other corded chainsaws, the chain self-lubricates, meaning all you need to do is ensure the oil reservoir doesn’t run dry. This chainsaw is extremely good value. It is one of the least expensive options available – although that doesn’t mean any kind of compromise on quality – and on top of everything else, it looks pretty cool too. This might not be the most important point, but it still counts. All in all, this saw is another top pick. For the price, it is as good a chainsaw as you are likely to find, and it is a piece of kit you will be able to rely on. If you need a tough and dependable tool for any kind of light or moderate cutting jobs, this is another of our recommended picks. This chainsaw from Earthwise is another top pick if you are looking for a 16” corded model that is capable of clearing brush, cutting down smaller trees and preparing firewood. It provides 12 amps of power and will easily be up to any of these tasks and more. One of the best things about this saw is the fact that it is so light. At under 10lbs in weight, it is one of the lightest electric chainsaws you will come across. It is also extremely easy to use and maintain. It requires no tools for assembly, and the tension of the chain can also be adjusted quickly and easily without the need for any tools. It also features a useful automatic lubrication system – as with all the other models we’ve reviewed here – meaning the chain oils itself as long as you remember to keep the oil topped up. The large window and easy-to-read indicator make this as easy as possible. It has a plastic bar and chain cover and is also designed to minimize kickback. There is a safety button to prevent unintended starts, and another very handy addition is the cord retention hook. This keeps the cord out of the way when you are working, again, improving safety. We like the way this saw is easy to handle and yet is powerful enough to deal with any medium-duty use. While you won’t be cutting down any forests with this model, it will be more than sufficient for the everyday tasks most general users will need it for. This would be a great option for someone who wants a saw for basic use at home and who prefers tools that are as light as possible. It is easy to use, even if you don’t have the strength for larger models, and is very reasonably priced. Another recommended product. As you can see from our reviews, there are many good options with largely similar features. Whether you need a 14” or 16” model for general use or an 18” model for bigger jobs, all the chainsaws on our list are excellent products and are all highly recommended.